This 10 sheet set of plans depicts H.M.T. Olympic in her WWI configuration from 1917 to the Armistice. 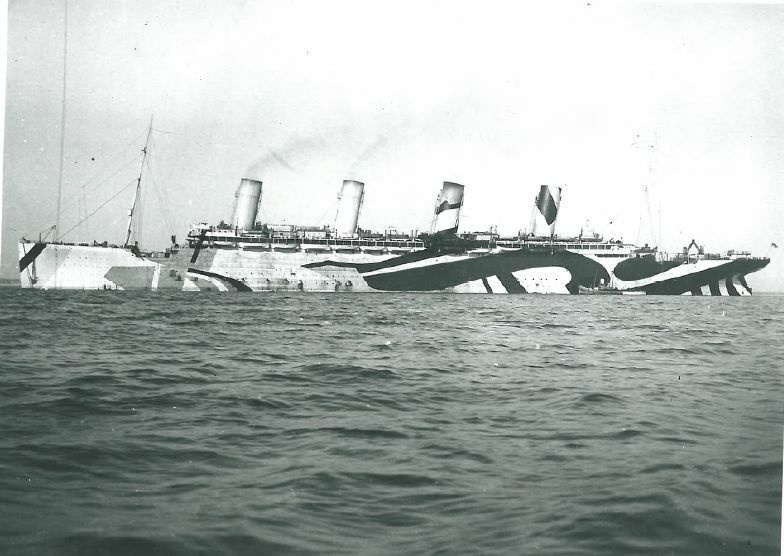 This period is notable for her camouflage schemes which were called “dazzle camouflage”. The early scheme, designated 19A, was applied in in 1917 and remained until some time in 1918. The later scheme, designated 19Ax was applied in 1918 and remained until the Armistice. Actual full size sheets are in 1/144 scale and are 3 ft. wide and 7-10 ft. long depending on the plan. Images of the individual plan sheets are shown below. Also included are enlarged areas of the plan sheets to show detail. Below is a closer view of a section of this plan showing some of the details. This plan sheet is a drawing of the full port profile of the ship. Frame locations are indicated. HMT Olympic 3 – Plan Ordering Code HMTOL3 – Price Per Sheet $40.00 USD. HMT Olympic 5b – Plan Ordering Code HMTOL5b – Price Per Sheet $35.00 US This plan has drawings of all the ship’s boats, their positions on deck, and the types of boat supports used in various locations. This plan sheet is a drawing of the shell plate expansion. This drawing has never been found among the original drawings. It was created using the Olympic framing plan and the Olympic shell plating plan. The plan is of constant scale both vertically and horizontally. All hull plates on the starboard side can be visualized in this expansion. This plan will help the modeler in plating the hull.